TCWH announces that InMotion hosting launches $75 free Bing/Yahoo search credits, in addition to the $100 free Google AdWords credits, with their business-class web hosting plan. The leading web hosting review site Top-Cheap-Web-Hosting.com announces that the award-winning business web hosting provider InMotion hosting launches $75 free Bing/Yahoo search advertising credits in addition to the $100 free Google AdWords credits launched in Jan, 2012, with their small/medium business web hosting plans. 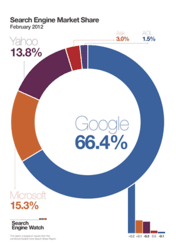 By the latest search market statistic in February 2012, Bing/Yahoo search commanded 29.1 percent of the search engine market. The advertising campaign in Bing/Yahoo helps people connect with 166 million unique searchers in the US including 57 million searchers who don't use Google; target some of the 6 billion queries every month that could be for your product or service; reach out to an audience that's likely to spend 24.1% more than the average searcher in the US advertisement on Bing and Yahoo Search. Generally, the keyword advertising campaign is pricing about $0.5 per click in the middle competitive field. The free $100 Bing/Yahoo search credits from InMotion hosting help clients have about 200 targeting potential consumers additionally, which may generate over thousands of revenue if it's utilized well. Unlike other web hosts offering overselling web hosting products competing on the budget price, InMotion hosting is designed to develop the Internet businesses of clients, with focusing on providing the consistent high-quality speed, reliability, and customer service. InMotion hosting is not only outstanding on the Internet business, but it understands the business intention of clients for web, and knows how to assist clients to extend their revenue via web from scratch. InMotion hosting offers the most complete way to grow customer businesses online. Compared to the latest cutting-edge technology supported by InMotion hosting as well as most of other web hosts, InMotion hosting offers the following exclusive features and properties which people cannot find elsewhere. Top-Cheap-Web-Hosting.com (TCWH) is a leading web hosting review website. TCWH, reviews web hosts unbiasedly based on the true experience and feedback from real customers. The mission of TCWH is to help people find the best web hosting deal, and save time and money from a bad choice.